Ideally suited for 3-5 year olds, this magazine will introduce yet a new generation to Mr Men the timeless and ever popular creation of Roger Hargreaves. Buy a single copy or subscription to Mr Men Little Miss magazine. 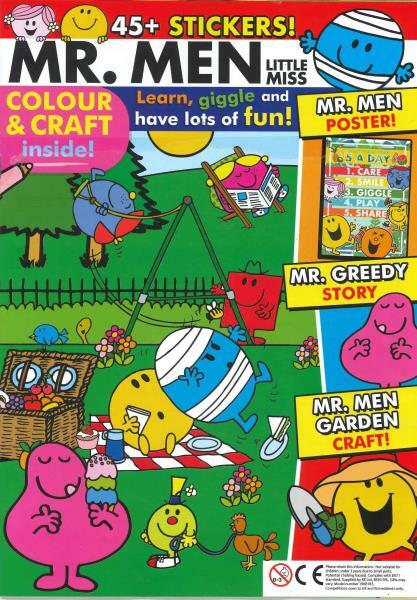 Each issue will take young children on an exciting adventure with many of the numerous Mr Men Characters. Fabulous magazine full of fun. Educational and packed with activties and interesting features, with superb free gits included in every issue. My grandson loves having this magazine addressed to him and eagerly awaits the next issue. I bought this for my 4-1/2 year old grandson, who loves the Mr. Men and Little Miss books. He can't wait to get it out of Nanny's special bag when I take it to his house, and just loves the gifts and stickers. I think spot the difference and colouring in are his favourites. Wish it was weekly, as some other mags just don't have the same appeal and educational quality. Thank you. Lillian. The Mr Men magazine is absolutely the best thing we have ever bought my little 4 year old grandson. He adores it and can't wait to sit down to the stickers, puzzles, stories and the different items to make each time. It is just perfect for him now, and for several years to come. The magazine is educational and fun to work out with children. My little grandson has been getting the Mr. Men magazine and books since he was 3, and absolutely loves the day Nanny brings the magazine to him. It has helped him read, colour, spot the difference as well as making him laugh out loud at the stories. Would very highly recommend and the price is brilliant for the content.